CHRISTMAS EVE AND CHRISTMAS DAY WORSHIP SERVICES! 2017 is one of those unusual years when the Fourth Sunday of Advent is also Christmas Eve! Here’s what we plan to do: We will celebrate the Fourth Sunday of Advent on Saturday, December 23 at the 5 p.m. service. • On Sunday, December 24 we will begin with our Festive Family Service with Children’s Christmas Pageant at 4 p.m.
• At 9:30 p.m. we will have a carol sing-a-long followed at 10 p.m. with Mass of the Christ Child. 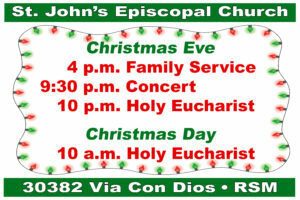 • Christmas Day, Monday, December 25, Holy Eucharist is at 10 a.m.
See you at St. John’s! All are welcome!